At Duke University, the Science Drive Garage anchors the main campus portal. Building the garage on an existing lot maximizes land use and provides users with access to public transportation, lodging, educational facilities, and sporting venues. The garage’s environmentally friendly design begins with the entry plaza, which includes a mix of green space and hardscape and hundreds of trees and shrubs. 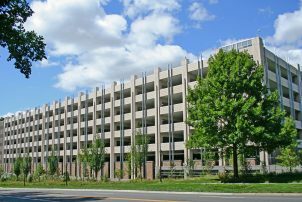 Faced with limited parking and a steady increase in demand, the university built this sustainable garage as the primary parking facility for graduate and professional students on West Campus. The garage also adds parking access for the athletic facilities where some parking was lost to new construction. It has electric vehicle charging stations on all tiers, low-emissions vehicle spaces, and moped, motorcycle, and bike parking. The parking fixtures have individual motion/photocell controls to maximize light harvesting. Roof and exterior fixtures feature photocell controls. In lieu of site generators, emergency power is provided externally by the university. An uninterruptible power source system is provided for strategic equipment. PARCS equipment, including automatic vehicle identification (AVI) for permit holders, streamlines the garage access. It maximizes traffic flow efficiency, thereby reducing emissions from cars searching for parking spaces. Todd A. Lohman, PE, is a vice president at WALKER CONSULTANTS. As printed in PARKING September 2018 Issue. Click the link to the left view the current issue.